By Ippolito Salviani. Romae: Apud eundem Hippolytum Saluianum, mense Ianuario, MDLVIII [i.e. 1554-1558]. 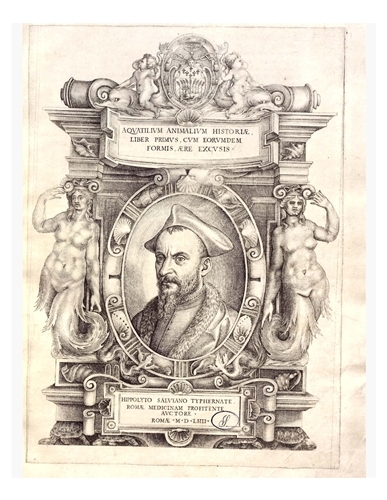 Salviani's book on aquatic animals is renowned as one of the three 16th-century works that established ichthyology as a modern science; SIL holds the other two, and this completes the trio. A professor of medicine at the University of Rome and physician to several Popes, Salviani collected fishes in the markets of Rome for anatomical examination to support his systematic studies, correcting and expanding the works of ancient authors (Aristotle, Pliny, et al.). 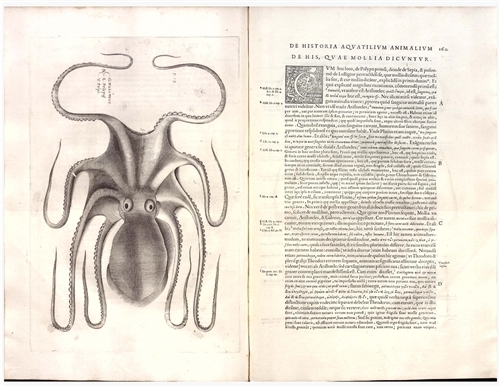 Ninety-three species of fishes and cephalopods are depicted in the full-page illustrations, with 18 of them new to the science of the time. The work is the earliest zoological book illustrated with copper-engraved plates, far more suitable than the woodcuts typical of the period for reproducing in fine, silvery lines the visual effect of fish scales and the delicate fins.